Household appliances have become an indispensable part of our daily lives. The energy consumption and safety of these appliances are key factors when it comes to making a purchasing decision. As a result, electrical appliance manufacturers have invested heavily in the research and development of their products’ energy conservation and safety. The harmonic and power consumption measurements play an important part in research, development and production of these household appliances. This paper focuses on the role ITECH’s IT9121 power meter plays in making harmonics and power consumption measurements. The IT9121 power meter can provide the rated input of 600Vrms and 20Arms, with a voltage and current accuracy of 0.1%. It can be used for accurately measuring the voltage, current, power, frequency, harmonic and other parameters and is applicable to related tests of the household appliance industry. The special 5mA range makes direct testing in accordance with EN50564 possible, without the need for an external transducer. From the safety perspective, the harmonic suppression of electrical products, i.e. power factor correction, is critical to household appliance manufacturers. The accurate harmonic measurement of household appliances is the premise for efficient harmonic suppression. As for the harmonic measurement, the measurement results of the ordinary power meter are generally different from the real value, as the sampling rate and bandwidth are limited and high-frequency components cannot be measured accurately. The ITECH IT9121 power meter’s bandwidth of 100 kHz enables high-speed harmonic measurement with a wide dynamic range. In the harmonic test, the voltage, current, active power, reactive power and phase of each harmonic wave and the total harmonic distortion (THD) factor can be tested. These Harmonics can be measured up to the 50th harmonic order. The IT9121 power meter can display harmonic parameters either in bar chart form and or numeric list form (see Fig. 1) on the front panel screen. When the operating states of the electrical appliances change, the power consumption will change accordingly. When the operating power consumption is measured, the ordinary power meter can only be used for integral measurement within one range. If the measured value is beyond the current maximum range, the range should be switched manually before integration, which may cause measurement errors and nonconforming measurement accuracies. 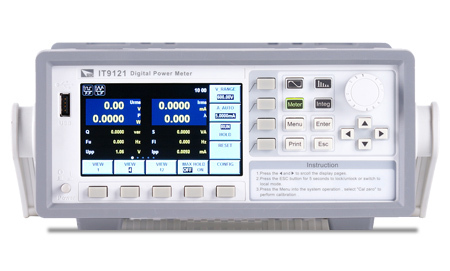 The IT9121 is equipped with the unique integral mode which enables automatic range switching which reduces the switching time and also solves the problem of integral measurement errors caused by manual range switching. This improves the accuracy and efficiency of the power consumption of household appliances. With increasingly severe global resources, the energy problem is more important, the standby power consumption problem of household appliances has attracted more and more attention, and the testing accuracy of the ordinary power meter is not applicable to such tests. For the ITECH IT9121 power meter, current with resolution down to 50μA can be measured with the IT9121’s low current range of 5mA, and the lower standby power consumption can be measured in the future with the power measurement accuracy of 0.01W. In addition, the IT9121 power meter can be used for accurately testing household appliances with the power higher than 1200W. The direct current input range is up to 20Arms. Under the rated voltage of 220Vrms, the power consumption of 4400W at most can be measured. This makes the IT9121 a perfect test solution for the power test of high-power electrical appliances. Wiring problems often occur when using a power meter to test household appliances. The mains plug should be cut off to lead the internal L, N and GND wires, and the voltage and current terminal of the power meter should be connected into the circuit according to the voltage and current parallel circuit principle, as shown in the figure. ITECH solves this problem with the introduction of the IT-E185 measuring fixture box. Using the measuring fixture box with the IT9121 power meter simplifies wiring and leads to safe and easy testing of household appliances (see figure above). ITECH Electronics has been dedicated to study on test solutions of related industries with “power electronic” products as the core. The IT9121 power meter is one of star products of ITECH and has high quality and performance, which are the advantages of ITECH products. When it is used with the IT-E185 measuring fixture box, test demands can be realized quickly and easily in the field of household appliances, motors, UPS, etc.